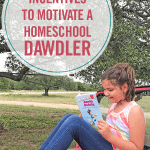 I read this article and wanted to share it with you: 3 Clever Incentives to Motivate a Homeschool Dawdler https://blog.sonlight.com/incentives-dawdler.html. 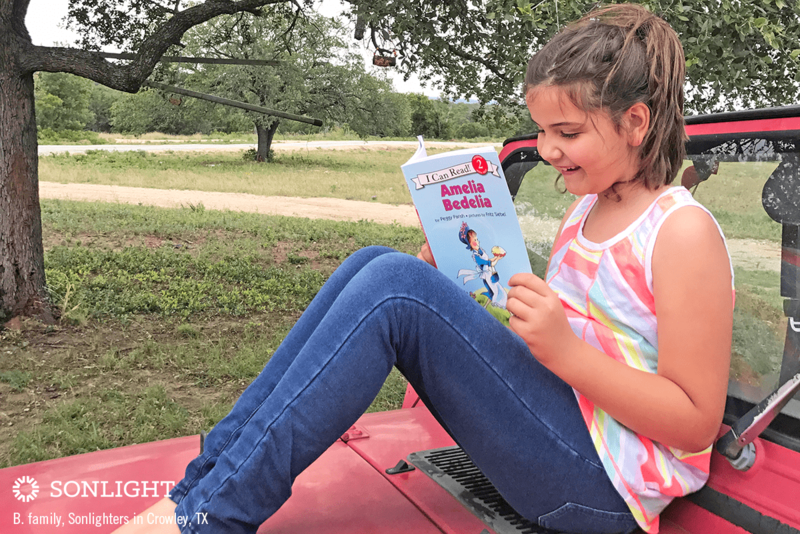 For mid-elementary through early middle school children, I’ve found that incentives—both tangible and intangible—work well to motivate a homeschool dawdler. I tend to use them temporarily to stimulate a lagging child and then taper the rewards, expecting the schoolwork to become its own reward. Of course, after time I may have to resort to an incentive again when children need another boost of motivation. This cycle is natural, and I have no qualms about using extrinsic rewards where needed. After all, I use incentives for myself when my own spirits are lagging about doing a job! Each child is unique and responds differently to rewards. So it does take some trial and error to find the best incentives when dawdling needs to be nipped in the bud. Here are my three go-to incentives for kids who dawdle. Sometimes simply showing children there is an end point is enough to motivate them. Instead of having my children work until an assignment is complete, I may have them work for a set number of minutes instead. Once the time is up, they are done with that subject for the day. Some children work best with a timer so they can see the minutes counting down and look forward to being done. You can purchase regular timers that show time elapsed, visual timers that highlight how much time is left, or fancy hourglasses that slowly trickle away the minutes. Seeing that visual reminder that time is ticking away helps many children stay on task instead of dawdling. Another good use of timers is to give children a reward if they can finish their work within a certain amount of time. Or encourage kids to work faster by asking them to beat their previous time by a certain number of seconds or minutes. An easy reward that doesn’t cost anything is simply the promise of more free time—extra recess, extra screen time, or any similar reward that you know will appeal to your child. To use this incentive, simply set a time frame for a homeschool subject. It can a scheduled task, such as math between 9:00 and 9:30 am every day, or a routine task, such as reading for 30 minutes a day. 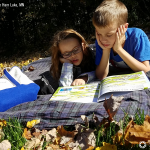 If a child is especially reluctant or has a terrible case of dawdling, offer the free time reward immediately after he finishes the required homeschool time. If the child is older or the dawdling isn't as severe, you can record the work and award all the extra free time at once on a weekly basis. Reward charts are highly versatile and easy to use. You can use a sticker chart, a daily checklist, or any other type of record keeping you desire. Use the chart to track completion of homeschool tasks your child dawdles over. Then depending on how well your child can delay gratification, offer daily or weekly rewards based on the charts. A sticker chart typically uses one sticker for each completed task. The sticker chart itself may work as a standalone incentive, but if your child needs a little extra motivation, you can offer rewards for each filled chart: a trip to get ice cream, an hour at the park, or a chance to choose a weekend meal. 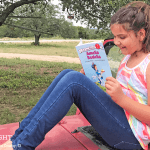 The candle method works great for read-alouds and other subjects where the child is not expected to produce output but needs to pay attention. Simply light a candle at the beginning of your read-aloud session, and as you read, give warnings each time your child interrupts (with comments not related to what you are reading) or stops paying attention. After two or so warnings, simply blow out the candle. When the candle is completely burned up, the child earns a reward your previously agreed on. When you need to reward individual problems for a serious dawdler, the M&M or LEGO method works well. The premise is simple. Lay one M&M, or one LEGO beside each math problem. As soon as the child completes the problem correctly, they get the candy or LEGO award. If their answer is incorrect, either mom gets the reward, or they can try again to earn their prize. Set up for this incentive is simple. You need a large jar and enough small pieces to fill it. I like marbles or colored rocks for aquariums, but you can use anything similar in size. Each time your child does a good job, they get to put a marble in the jar. When the jar is full, they have earned a reward. These boxes require a trip to a dollar store for various assorted toys, treats, games, and fun school supplies. Create a price list and mark each item in the box with the number of points/stickers/dollars it will take to earn each item. The incentive box has an added bonus of teaching your children to share if you allow them to gather points collectively to earn larger items. With some children, you’ll find it’s hard to figure out what their motivational currency is, in other words, what stimulates them to do their work. In that case, use as many methods as it takes to find what really helps them stop the dawdling and get on track with completing their homeschool lessons. We can't promise your kids will never dawdle with Sonlight. But you can order with confidence because of our 100% guarantee.